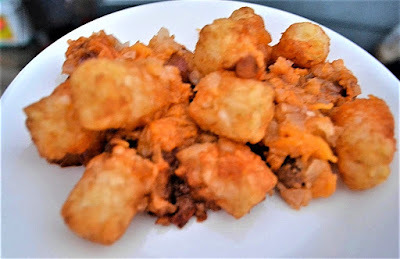 Cheesy Chili Tots is one of those Make once, eat twice meals. Make one for dinner tonight and while your at it, make a second one to stick in the freezer for another time. I love freezer meals that are not only quick to put together but are filled with ingredients the whole family loves. I also love how adaptable this recipe is to suit your own individual taste. 2 (32 oz.) packages frozen tater tots. Jan's tip: If you want to make this even quicker substitute out the meat, tomatoes, and chili beans for cans of store bought chili such as our favorite; Hormel's 98% fat free turkey chili. In large skillet cook ground meat over med. heat till cooked through and no longer pink. Drain. Sti in the chili beans and tomatoes (or sauce ) Stir in any optional ingredients at this time too. Divide mixture evenly between two 8 x8 inch baking dishes. Sprinkle 1 cup of cheese over each casserole. Cover and freeze one for up to 3 months. 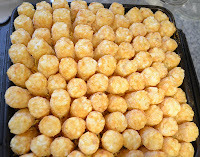 To bake the other immediately for dinner: Bake at 350 degrees 30-35 minutes till heated through and tots are brown and crispy.